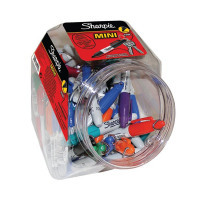 These fun-sized Sharpie Permanent markers provide quality, fast drying ink that can be used to mark almost any surface, including plastic and glass. The cap features a clip for easy attachment to key rings, lanyards and carabiners, so you can take a Sharpie marker wherever you go. This pack contains a tub of 72 mini markers in assorted vivid colours.